Peter Howson, Prophecy, 2016, oil on canvas, 72 x 96 1/2". 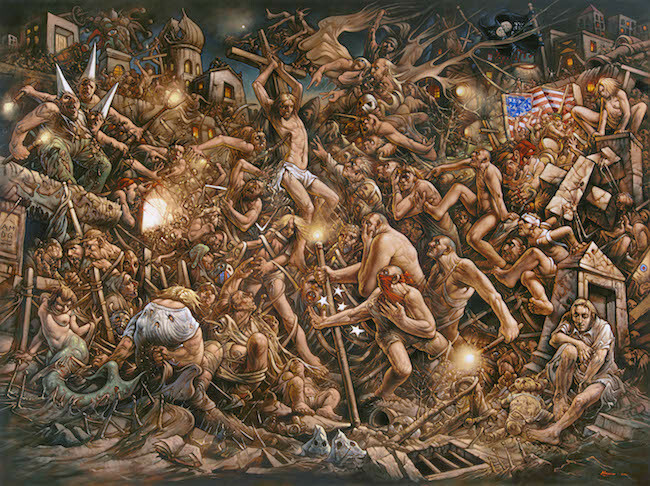 Scottish artist Peter Howson is known for dramatic paintings of brutal melees in urban settings and muscular working-class men in noble combat or heroic poses. Elements of his own tumultuous experiences are often writ large, including his upbringing in a God-fearing environment and his struggles with depression, Asperger’s syndrome, alcohol, and drugs. In 1993, he was Britain’s official artist for the Bosnian conflict. In this role he created a work so horrifying that London’s Imperial War Museum, which had commissioned him, did not accept it into the permanent collection. During a 2000 treatment for addiction, he became a born-again Christian. These themes coalesce with calamitous, biblical frenzy in his current show. Of several large canvases the principle work is Prophecy, 2016—also the title of the exhibition—a vicious nighttime street battle thick with fighters clamoring toward a central crucified Christ. The baroque cavalcade of ogreish figures and folkloric fiends stretches from spire to gutter as they wield blood-curdling medieval weaponry. Minarets and stone crosses tumble, flags of ISIS and the United States flail, all of which is illuminated by the baleful glow of lanterns and a distant moon. This desperate wreckage of humanity, just shy of being historicist kitsch, is nevertheless moving. Human-giant hybrids with blistered complexions make up a suite of smaller, divisionist oil-on-gesso panels. While they suffer from a compressed scale, Whoin? Warum? Wie? Where? Why? How?, 2017, depicting a shirtless hulk holding flaming torches, is an unnerving symbol of socialist zeal and tortured resistance. These unabashedly religious works—a quality often shunned in contemporary art—are gripping in their evocation of the church’s barbarous legacy and an apocalypse perhaps only moments away.